Caring for a ferret is not that difficult. Your docile, furry friend is just as easy to care for as a cat. If you manage to train it while it is still young, you can even teach it how to use its own litter box. There is really nothing much that will make you dislike a pet like a ferret, especially if you are one who loves to have one small and gentle friend in the house. 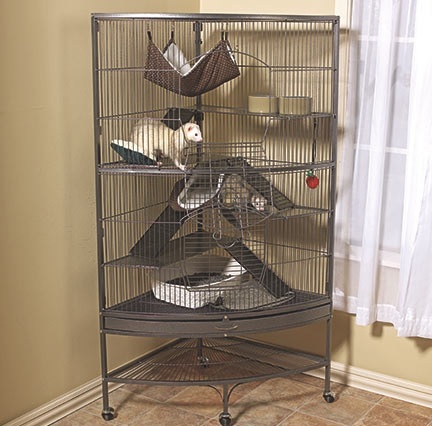 To keep your pet a lot cleaner is to find the best ferret cage where it can spend much of its time, however. The Spay Austin Coalition was recently notified of a desperate situation on Santa Rosa street in east Austin by Shadow Cats rescue. Feral cat trappers Julia Hilder (Spay Austin Coalition President) and coalition member Calene Summers (Thundering Paws) answered the call only to find one of the worst situations they could imagine. What started as a few cats and kittens in a yard soon became the reality of an entire block overrun with wild cats and kittens. One of the neighbors puts food out regularly, the others throw out food scraps for the cats to scavenge. As Julia and Calene began trapping the first few cats they quickly realized there were many more than originally reported. As Julia was trapping one day, a resident pointed to an orange tabby and said, “That’s the mother who started it all”. Her current litter is living in a box on the front porch. The cats have staked out their territory in individual yards, living in bushes and under cars and homes. Several litters of kittens, in addition to the one on the porch, have already been born and the females without new kittens are pregnant and will give birth any day. So far more than 20 kittens have been removed from the neighborhood and, had they not been rescued, would have been doomed to a life of misery. 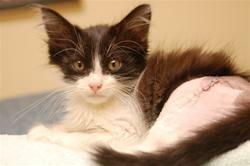 One kitten was found limping down the street with a broken femur after being hit by a car. Julia rushed this tiny kitten to Riverside Veterinary Clinic where a pin was placed into her leg. She is indeed one of the lucky ones. The adults are too wild to be adopted so they are being spayed and neutered, then returned to the neighborhood where they will continue to live, but will no longer contribute to the overpopulation problem. The process of sterilizing feral cats and replacing them where they were found is called Trap-Neuter-Return (TNR). TNR naysayers contend the cost of surgery for these homeless cats is not worthwhile and would be better spent on family pets. However, studies have shown not only does it stop the breeding cycle, the cats have claimed the area as their own thereby preventing new cats from moving in to start the cycle all over again. Of course, all it takes is two intact cats abandoned in that neighborhood, which is why it’s so important to spay and neuter all pets at an early age. The Spay Austin Coalition began as a concerted effort by a number of animal welfare groups working together to reduce the number of animals killed at the Town Lake Animal Center. After six years, our efforts have started making a difference. We were chosen as the group to assist the director of TLAC in drafting the original guidelines for the citywide TNR efforts that continue today. The ASPCA funded a grant called Mission Orange that provided resources directly to spay/neuter programs in Austin, including specifically for feral cats. If you are interested in helping the Spay Austin Coalition in our efforts, please consider donating today. If you want your funds to go directly to the Santa Rosa Project, Shadow Cats Rescue has set up a funding page. All of the donations through that portal go directly to the care of the Santa Rosa cats and kittens. If you want to donate without specifying a project, simply use the Paypal button in the upper right corner of this page. The Spay Austin Coalition is an all volunteer organization with IRS 501(c)(3) status. All donations are tax exempt and go directly to the care of the animals we work with. We have no – zero – paid staff or administration costs. If you don’t have the funds to donate, please consider fostering or adopting a kitten (or two, or three). To foster or adopt, send an email to president at spayaustin dot com, or check the President box on our contact form. The socialization of these kittens at an early age insures they will be suitable for adoption, where they will live a long and happy life as part of a family. Maybe yours. And finally, while many concentrate their efforts on blaming cats, the real culprit, homo sapiens, goes free; continuing the destruction of habitat, hunting, killing, and using pesticides that endanger entire populations of wildlife, including millions of birds. The following is a collection of opinions from experts who have studied feral cat predation and who do not blame cats for detrimentally impacting wildlife. The following is an excerpt from Roger Tabor’s Understanding Cats, (The Reader’s Digest Association, Inc.: New York/Montreal, 1995). “While the size of the range of rural feral cats reflects their prey requirements, prey is not necessary for the survival of domestic house cats, their range sizes are independent of its abundance. While this could make them more of a danger to wildlife, this does not occur for a number of reasons….Not all house cats are competent hunters and most only catch prey occasionally….Although cats are superb hunters, it is their scavenging ability that allows them to survive as feral-living animals and live with us eating food off a saucer. Are concerns of cat predation and effects on birds/wildlife valid? Jeff Elliott wrote an extensive article for The Sonoma County Independent, “The Accused,” (March 3-16, 1994), which investigated frequently used studies that implicate cats in the decrease of wildlife populations. Following is an excerpt from the article listing the studies and his findings of their accuracy. “Studying the hunting trophies brought home by 78 cats in a single English village, Peter Churcher and John Lawton found birds were 35 percent of the kill —by far the highest estimate in any such study. In a 1989 condensation for Natural History magazine, they multiplied their results by the estimated number of cats in the entire nation. Rarely are projections made with such limited data, except in junior high science projects—which may be an appropriate comparison, considering Churcher teaches at a boys’ school. “Researchers in Wisconsin cite cats for killing 19 million songbirds. “Doctor Stanley Temple, co-author of this frequently quoted work, seemed exasperated when asked again to rehash his findings. ‘The media has had a field day with this since we started,’ he sighed. Those figures were from our proposal. They aren’t actual data; that was just our projection to show how bad it might be.’ No one interviewed has seen Temple’s unpublished research. The following is an excerpt from Peter Neville’s Claws and Purrs: Understanding the Two Sides of Your Cat (Sidgwick and Jackson: London, 1992), p. 164. Mr. Neville is the Director of the Center of Applied Pet Ethology in the United Kingdom. “In England, at least, there is no evidence to suggest that the occasional high mortality of birds due to pet cats has had any damaging effect on even one species of bird, however distressing to birds, bird lovers and cat owners that predation may be…. B.M. Fitzgerald, Ecology Division, Department of Scientific and Industrial Research, New Zealand Mead has studied various aspects of feral cats (home range, effect on birdlife, food) and the effects of various predators on local wildlife, since 1970, in New Zealand. The following is an excerpt from Gary J. Patronek’s, VMD, Ph.D. Tufts University, “Letter to Editor,” Journal of the American Veterinary Medical Association, Vol. 209, No. 10, November 15, 1996. “If the real objection to managed colonies is that it is unethical to put cats in a situation where they could potentially kill any wild creature, then the ethical issue should be debated on its own merits without burdening the discussion with highly speculative numerical estimates for either wildlife mortality or cat predation. Whittling down guesses or extrapolations from limited observations by a factor of 10 or even 100 does not make these estimates any more credible, and the fact that they are the best available data is not sufficient to justify their use when the consequences may be extermination for cats. The following is an excerpt from a speech by John Terborgh (Director of the Center for Tropical Conservation, Duke University) at The Manomet Symposium in 1989, Smithsonian Institution, Washington, DC. “The global environmental crisis has caught up with migratory birds. There are simply too many people making ever increasing demands on a fixed supply of resources. It is inconceivable that we can continue on the same reckless path for very long. “The conversion of forests to cropland, pasture and urban sprawl, the downgrading of virgin stands to second growth, and the conversion of mixed forests to pine monocultures… The inescapable implication of this for conservation is that there is only a limited amount of time left in which to slow human population growth and to institute other fundamental changes in the countries of this hemisphere or many of our migratory birds will be little more than memories. What then is responsible for the decreasing number of birds? The following is an excerpt from a speech by biologist Dr. Robert Berg. “Habitat destruction: As man’s development of the planet continues, available habitat for animals and plants is being carved up into smaller pieces. The fragmentation of ecosystems separates populations genetically from each other, and if a particular habitat is not large enough, remnant populations contained within them are doomed due to genetic inbreeding. If there are not enough large areas, chance occurrences such as an extremely harsh winter, floods, localized disease, etc., can drive remaining populations to the brink of extinction. “Some species are dependent on environmental policy in more than one place. One endangered species of bird, Bachman’s warbler, is disappearing not because there is a scarcity of riverine swampland in the (Southeast) United States in which it breeds, but because it used to winter in the forests of western Cuba virtually all of which have been cleared for sugar cane.